Like clockwork, Apple has once again offered up numerous improvements to the iPhone’s software in a June release. Although all eyes were on thenew iPhone 4 at Apple’s Worldwide Developers Conference two weeks ago, the new smartphone would be just a stylish chunk of stainless steel and glass without iOS 4, the new operating system that arrives today. For the last couple of weeks, I’ve been running Apple’s newly minted iOS 4 to find out whether it, like previous OS updates, breathes new life into the iPhone lineup. 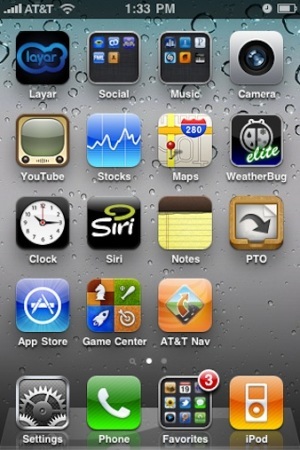 Apple’s new iOS 4 allows customized home screens. While the overall look and feel of the iPhone’s operating system remains unchanged, Apple has built in steady and solid improvements that add features users have asked for since the last big update a year ago. Instead of changing things for the sake of changing things, Apple tends to focus each major iOS release on a few well-implemented features. This year’s release — which iPad users will get this fall — shows that the development teams at Apple have delivered, among other things, limited multitasking for third-party applications, better application sorting and management, and improved e-mail functions. The end result is an updated operating system that makes using the iPhone a much more polished experience, all without sacrificing battery life. With the focus now on iOS 4, here are the five changes that should persuade you to get the upgrade as soon as you can. Finally, third-party multitasking has arrived for the iPhone — at least for the owners of the iPhone 3GS and the new iPhone arriving this week. (Users of the iPhone 3G won’t be able to take advantage of the new multitasking services.) And you’ll be happy to learn that Apple’s implementation of that functionality works pretty well. True, it’s not the full-on multitasking you get in Mac OS X. But Apple has smartly implemented seven separate services that allow applications to continue to perform tasks while the user switches to another application. The reason for the limit? To help preserve battery life. The multitasking services include the following: background audio, which means users can play music from Pandora in the background while using other apps; background voice-over-IP, so Skype users can remain on their calls — even if they switch to other apps; background location, which allows apps that use GPS to track where you are; push notifications, which were first introduced in last year’s iPhone OS 3; local notifications, a service that can track and alert application events without relying on Apple’s push notification servers; task finishing, so uploading photos to Flickr isn’t interrupted just because you switch to another app; and fast app switching, which quickly saves the app’s current state when you switch to something else — and brings it right back to where you left off when the app is relaunched. To aid in switching to other apps quickly, Apple adjusted the iPhone’s functionality so that a double-tap of the Home button calls up an app-switcher, featuring the four most recently used apps. A swipe on the touchscreen to the right reveals audio controls and a screen rotation lock; a swipe to the left reveals more recently-used applications. Tapping and holding allows you to manually kill running apps, if you’re so inclined. With these seven services, Apple offers the basics iPhone users will want from third-party multitasking. Now it’s up to developers to build apps that take advantage of those changes. It’s amazing how the addition of folders in iOS 4 can make the difference between a frustrating user experience and a pleasant one. Until now, users have been forced to launch applications by either swiping through pages of apps, or by resorting to a Spotlight search. For my own part, I had 11 pages full of applications — the natural limit of apps that can be displayed on the iPhone. Sometimes, different apps that did much the same thing each had a feature or two I really liked, but I had no way to group them together. As a result, they filled up all 11 pages — crowding out other apps I might want. With iOS 4, I’ve gone from 11 home screens to two, since I can now organize applications in folders, each of which can hold 12 apps. According to Apple, you can now house 2,160 apps if you utilize all of the folder space. Now that the home screen is much more manageable, I have room to grow — and I’m again interested in exploring new iPhone apps. And given that the App Store now has more than 200,000 individual applications, the change is good for users and developers alike. Apple’s implementation of this feature is slick, yet obvious. To create a folder, tap and hold on an app icon until the apps begin to wiggle. Once that happens, drag and drop an app on top of another app, and a folder is instantly created, with the iPhone background sliding away to reveal a storage area. Folders are automatically named using app genres, but you can modify them. There’s one thing that would make this even better: the ability to password-protect folders. As much as I enjoy sharing my iPhone with curious passers-by or overexcited god-daughters, I’d feel more comfortable if I knew certain data couldn’t be readily accessed by anyone who happened to be poking around. Just sayin’. Apple continues to improve enterprise support with this update. Exchange 2010 now works with iOS 4, and the iPhone now can sync calendar, contacts and e-mail with more than one Exchange account. Security has improved as well; iPhones now uses their passcodes as encryption keys, and Apple has introduced new APIs developers can use that focus specifically on making sure private data stays private. Also of note: iOS 4 allows enterprises to securely host and distribute in-house apps over the air without forcing users to connect with iTunes on their host computers. Enterprise users will also appreciate the fact that it supports SSL VPN security. While iOS 4 still doesn’t support FIPS 140-2-certified encryption (a standard some government agencies require) or over-the-air software updates (for better IT management), IT departments will definitely appreciate its enhancements. The changes represent another step by Apple that could convince holdouts using the BlackBerry platform that it’s time to open up their systems to the iPhone. Apple’s iOS 4 is filled to the brim with small enhancements to the interface and built-in applications that will delight users. For instance, with iOS 4, the iPhone 3GS can now refocus video — while recording — with a simple tap on the screen. Tap-to-focus has been around for still photos since Version 3, but the ability to refocus on the fly for video is a new feature for the iPhone. Speaking of camera improvements, it’s now possible to use the digital zoom feature when snapping photos on older models, such as the 3GS. While a digital zoom is no substitute for optical zoom — if you go too far, your pictures get pixelated — I’m willing to bet that many users will find it useful. 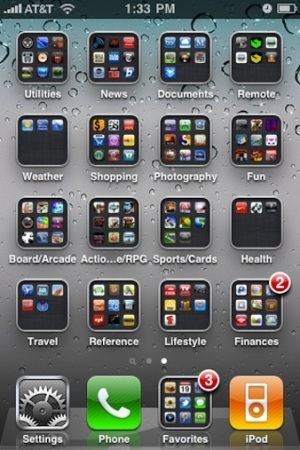 iOS 4 allows applications to be grouped into folders. The Photos app now supports Faces and Places, two features found in Apple’s iPhoto software. Faces can track photos based on an individual’s facial features. Places supports geo-tagging, which groups photos by location on a map. Both will help iPhone users better organize and sift through their photos. The iPod music software has also gotten some minor tweaks. 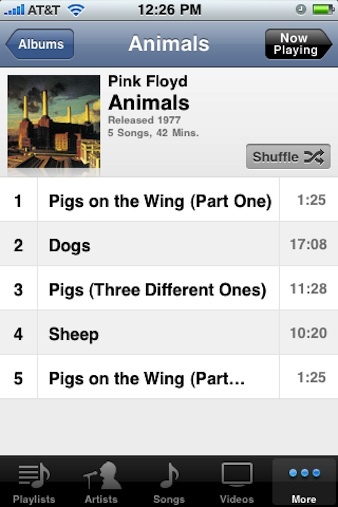 For instance, in iPhone OS 3.x, the Album view listed a Shuffle option first, and then featured a simple song list. But the new iOS 4 displays more information when a specific album is selected, including album art, release date, song count and overall length, plus a Shuffle button — all at the top of an album’s song list. The list of songs in the Album view displays more information, too, including a subtle gray coloring behind song titles, a track number, a speaker icon indicating which song is playing, and track length in minutes. Mail now supports e-mail threads, storing e-mails with similar subject lines in a unified list, allowing for better conversation tracking. And the Mail app now supports a Unified Inbox, allowing you to keep track of all of your e-mail in-boxes in a central location. Other enhancements include the aforementioned on-the-fly playlist creation; external bluetooth keyboard support (similar to what’s in the iPad); Game Center for gamers; Location Services control on a per-app basis; the addition of Bing as a search option; Calendar support for iCal birthdays; support for iBooks, including newly added PDF, notes, bookmarks, and automatic remembering of your spot across multiple devices like iPhones and the iPad; new luscious home screen wallpapers that should look stunning on the new iPhone 4’s retina display screen; character count in the SMS app; and — finally — support for Internet tethering from AT&T. A side note on tethering: Normally, this would be included as a major feature, if not for the fact that it’s crippled by AT&T’s pricing structure, or the fact that this feature has been out for more than a year for iPhones on better carriers. Thanks, AT&T. While I’ve focused here mainly on user-facing features that arrive with iOS 4, there are hundreds of back-end improvements that will allow developers to produce even better apps for both the iPhone and the iPad. Here are just a few examples of features developers can add to their apps: iPod remote control accessories, in-app SMS messaging, spell-check, photo library access, Quick Look for document viewing, full map overlays, access to still and video camera data, access to date and address data detectors, and access to Calendar data. In other words, if you appreciate the breadth and depth of the still-growing number of applications in the App Store, you can expect them to get better as developers adopt these new functions and add them into their apps. The iPod app now shows more song information. Apple’s iOS 4 offers a number of compelling reasons for users to upgrade, featuring performance and app enhancements that are well worth the price. That price? It’s free for all of the hardware devices that can run it (even the iPod Touch). Upgrading should be simple: Plug your iPhone or iPod Touch into your Mac, launch iTunes, and click Check for new software. Follow the prompts and you’ll soon be ready to see for yourself. Is iOS 4 the pinnacle of smartphone technology? Of course not; there’s still a lot of room for improvement. (For starters, an organized notification screen for alerts would be really useful.) But the new features and tweaks in this update — in concert with the fact that Apple is giving the software away — make this upgrade a no-brainer. Michael deAgonia, a frequent contributor to Computerworld, is an award-winning writer, computer consultant and technologist who has been using Macs and working on them professionally since 1993. Find him on Twitter at @mdeagonia).